Are you shaming your child without realising it? I was so shocked this week at The Energy Pod as Mums cried when they realised how their children truly felt about being angry. I can categorically say that I grew up with the belief that nice girls don’t get angry which of course, is total and utter rubbish. Nice girls do get angry and they also know how to use the power of their anger for good. They channel it into making change and it’s a force to be reckoned with. Why were these Mums shocked? Because they had no idea how their children felt and of course, it upset them to hear their child talking in this way about their feelings. This is why I see angry children struggling to process this feeling because they feel really bad for having it in the first place. They hold it in and it comes out sideways. There are ways which we fuel this shame: being uncomfortable with our own anger, punishment, sending them away or telling them they need to be good (and making anger bad). Or maybe we are just repeating old parenting patterns and emulating our parents (who also inadvertently shame us)? I could go on but you get the picture. I’ve written before about why punishment doesn’t work and how blame creates shame. I often find that as a society we can be quite shaming and it shows up in all sorts of ways: the media pulling down somebody who has done well. You know that built them up and then when they are human, shame them for getting it wrong. That’s life isn’t it? We are going to get it wrong. All of us. Not on purpose but that is how we learn and if we live it fear of getting in wrong, we may not even try. I coach children like this too. Maybe you could download the replay of the class and see if your child feels the same? At least by watching it, they will feel validated and realise that they are not alone with their anger. Anger is a hot potato for many of us and it’s pretty much a given that if you are uncomfortable with your own anger, you will be uncomfortable around your child’s anger. The truth of the matter is: if you haven’t learnt how to process your anger in a healthy way, you cannot role model those skills to your child. Let me see if I can help you. Or having any feelings (it’s what makes us human). In fact, during class we talked about why we need to stay connected to our anger and learn to acknowledge its very important message for us.Mums wrote to me saying it had moved them to tears hearing their children say they felt ashamed of the way they felt and how they recognised their own shame. I wanted to hug them and say: ‘Well Done!’ for being honest. When you see your own shame and how that is contributing to a situation, well….the magic starts to unfold. Real healing can begin and the future for your child? Well it just got a whole lot brighter. “I wanted to write and thank you for the energy pod this week. Wow, that was a big one! I know my daughter benefited from realising she’s not the only one experiencing anger, and the reinforcement that it’s OK to feel like that. Anger definitely did come out in our house that night, just as you predicted, but with your help we were ready for it! I think the biggest impact of that class was on me though. I listened to the replay back on my own and followed up with all the links you posted. I’ve been doing some real soul searching about the shame thing. I wanted to cry thinking that my daughter felt like that. It’s made me think hard about my attitude to anger. I realised I do feel shame about it too. Not in principle, but that if anyone outside of the house saw me when I’m angry I would be mortified! There was a lot of anger in my house when I was growing up and I can see where my ‘stuff’ comes from. I could go on for pages with everything I’ve learnt about myself this week …. just from that one class. Sharing your story with somebody who gets it and meets it with empathy (no judgement here!). That explains why the children were delighted to get involved in this class. You could literally feel the steam coming off their keyboards and the relief in their little bodies as they released their anger. What a powerful class! And they walked away with other tools for next time when they get angry. Another great thing is that parents are learning through their kids. One Mum observed: ” I was so surprised to see my daughter write that” This was in response to identifying that anger is not as it first appears. The children felt uncomfortable getting in touch with their softer more vulnerable feelings like sadness or fear. They have beliefs that crying is babyish or boys have to be tough….this is very common in boys and I see it a lot in my work. How comfortable are you with your own anger? How uncomfortable are you when your child gets angry? Do you get embarrassed if they get angry in public? When an angry child comes to coaching I know that there is something else going on. My job is to get to the bottom of it. I’m an excellent emotions detective and I see familiar patterns. This type of parenting = this type of behaviour in this type of child temperament. I’m making it sound simple. It isn’t. Emotions and people can be complex. What does your angry child need? My Dad used to laugh at me when I got stroppy and my Mum used to shut that sh1t down because it made her look bad. Neither of those responses taught me that it was perfectly OK for me to be angry. 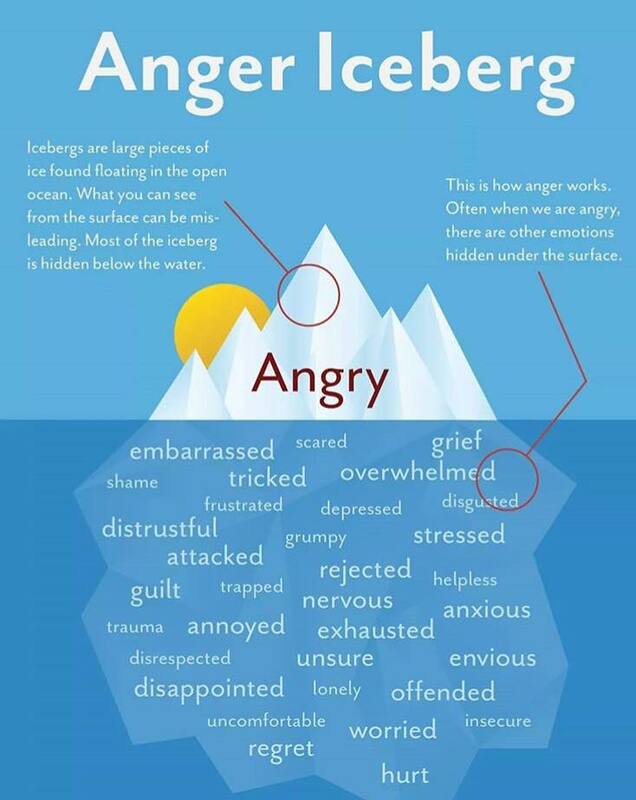 And it is…..Can you recognise your own or your child’s anger? Check out these 3 charts, I can see my anger in all three of them. Only saving that proper ranty rage stuff for my steering wheel because you know, if anybody ever saw me lose it that wouldn’t look very Smiley now would it? You can check out the replay of this very powerful Energy Pod Class where parents are learning through their children and children are seemingly having fun (yes they like it!) learning about themselves and the way they feel. Are you overcomplicating it in your mind? Are you letting fear or overwhelm stop you from growing closer and understanding your child? Please don’t because you are in safe hands. You truly are. And this is not just about you…it’s about them. So be brave….try something new! I know you won’t regret it and your kids most certainly won’t. I’m right beside you while you take 2 clicks towards a new way of being. A Smiley way to manage yours and your child’s emotions. Unless you are a robot or a tin man. I know you are not either of those, but I do know that you can expect to get emotional about life and if you aren’t connected to your emotions, you aren’t truly living. Merely surviving. It is a force to be reckoned with even though it’s light hearted and fun. I’ve seen total transformations in children and parents in a matter of weeks. Does this sound like something you want for your family too? Good, I want to work with families like yours. Families that are serious about making a commitment to their emotional wellbeing. So come on, you can come along to next week’s Energy Pod which takes place in your front room (no excuses you don’t even have to leave the house). Click TWO: Click on the link which I will then send you in an email so you can access the class. And if you’ve got swimming, or football or some other awesome club you go to (why do you have a better social life than me?!) then still book, because the replay will be sent to you or you can still get my feedback up to nearly a week after the class has finished. In fact, you can find all the replays of the classes we have done so far here. It’s a no brainer really and a great way for us to get to know each other better. I want that. I want to understand how I can help you and your child. Urrrm I’m sure you have. Like…. what if my kids wont do it? what if my kids don’t want to join in? what if it all kicks off during class? …..well, somebody else has probably already beat you to it. I’ve very kindly noted all the questions down and answered them here. No worries. You are welcome! I mean come on – what’s the worst thing that can happen? Nothing. Yes exactly. What have you got to lose? Mmm quite a lot. Think about it! And you know, if your child is a Wild Heart (strong-willed sensitive child) then you’ll wish you’d learnt all this stuff sooner…get your @ss to class!